Gehrig to Cooper to Chance. Before seeing "The Pride of the Yankees" you may or may not know that the Yankees referred to are the ones who win the World Series each year. After seeing it you will find that the reference is indirect. Deep down inside it's the baseball story of Lou Gehrig, the silent strong boy, who went from Columbia to the Yankee Stadium to hit home runs. It was at the start of the fabulous Yankees, when the manager was a runt-sized baseball genius named Miller Huggins, and "Murderers' Row" meant Gehrig, Ruth, Coombs and Meusel. For fifteen years Gehrig played first base, with something keeping him there in spite of broken toes and fingers and a sprained back. There was finally a tragic end: when Gehrig was thirty-four years old, disease ruined his perfect muscular control, and shortly he died. That was the story before the star system moved in. Gary Cooper had been Mr. Deeds, Wild Bill Hickok, Alvin York and Marco Polo, so why not Lou Gehrig? No matter that Gary doesn't like baseball, is right-handed, lazy and tall-skinny, whereas Gehrig was left-handed, hardworking to the point of compulsion, and his one leg was the size of two of Gary's. So they taught him to throw left-handed, but they could never teach him to throw with any muscles but the ones in his arms, like a woman, nor could they make his long legs run differently from those of someone trying to run with a plate between his knees, nor could they move his body with his bat swing. All of which meant cutting the baseball action to a minimum—montage shots mostly from long distance up in the press box, and the picture was shot to hell right there. It is pretty good, but so little of what it could have been. There is none of the artistic grace and coordinated power that is great ball playing, the thing that makes a heightning throw from short to first as thrilling as Koussevitsky conducting Sibelius, or an unbelievable one-handed catch out of the dirt as fantastic as a leap by Mickey Mouse. The acrobatic genius of Doug Fairbanks, which was partly trick camera but thrilled us anyway back in the twenties, comes a dime a dozen on any major-league ball field—and real. All that was needed was a natural ball player, and there are plenty around. There's one in this picture—Bill Dickey—who seems right at home before the camera. But instead they chose Cooper, cut the baseball, and used their old cliches for excitement: a boy in a hospital for whom Lou has promised to hit two home runs, or the last inning with the home team behind, two out and two on base and the idea of Gehrig being walked intentionally and disobeying the manager's orders by trying to hit (turn over in your grave, Huggins). If the writers of this movie know what it is about a baseball player, why he does it, and how, they didn't use their knowledge in the script. In place of this, which is as exciting and marvelous as anything can be, there are the usual fillers-in they use for any movie. A dance by Veloz and Yolanda, a song by Ray Noble, with one hand playing the piano and the other directing the orchestra like a fairy wand. Bill Stern and his radio claptrap, lots of Lou Gehrig in college among such standard collegisms as the snotty fraternity boy who doesn't want hard-working Lou in Alpha Alpha, and the jokes played on the bashful boy, a couple of idiotic newspapermen, one childish and the other villainous. I long ago lost interest in ail funny-but-good mothers and fathers, and the movie is stuffed with these. The picture, as a result, wastes its first two-thirds. They couldn't miss on the ending, and you will cry plenty. 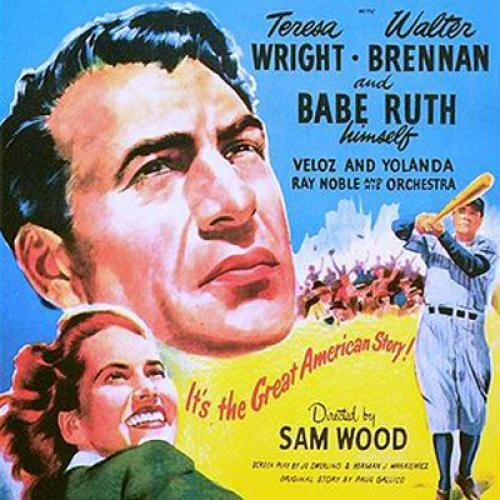 Actually, this man's picture was held together by a girl, Teresa Wright, as Mrs. Gehrig, who is good, no fooling. Since "The Little Foxes" and "Mrs. Miniver" she has added warmth and cuteness to talented plainness, and is still finely unlike a movie actress. Gary Cooper was directed to be modest and youthful in the first half, in other words to act—he's awful. Badly timed goofy smiles, blinking an" popping eyes, hands with the coordination of a moron. Later on, after Lou grew up, they left him alone and he is as always, plain and easy, a perfect movie player. But the best thing, outside of Miss Wright, is the camera work ofRudolph Maté, the finest I've seen this year (and when are they going to give the movies back to the camera?) Maté achieves exhilaration from his angle shooting and the feeling throughout out of a concave screen. Whatever feel of baseball this picture has is the result of his running camera. He uses a simple clarity of dark and light value without any of the thousand and one trick shadows seen in movies these days, and none of the murk of Rembrandt gone mad. When there's a fight the camera seems to be doing the punching. And with Maté, an expressive shot is never something that whams you over the head. Well, all right, but it looked as if they even had to teach the child actor to bat left-handed.